Bishop Ivan Lugoloobi grew up in the town of Jinja and in the Ndejje area which was badly affected by the civil war. 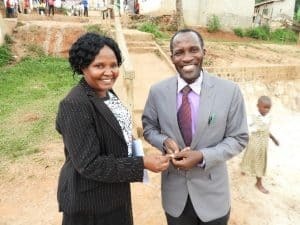 Pastor Ivan’s father Henry was a pastor in the Anglican church and worked with poor communities in these areas and helped run an orphanage in Jinja. Pastor Ivan left home to study Theology at Mukono University and graduated at the time Joweri Musoveni came to power in Uganda through a brutal war. He went into a Uganda devastated by Civil war, famine and the scourge of Aids and other diseases. There was much suffering in the areas he grew up in where many adults had died leaving children without parents and without hope. Providing a future for such children became the purpose of Ivan’s life. So with no money or a home of his own Ivan started his ministry in poor areas. He moved to the town of Matugga to work as chaplain to a junior school called Ladybird where his elder sister Esther was headmistress. Esther was a huge encouragement to the young Ivan but soon Esther died. In the year 2000 a team of church people from the UK visited Matugga and worked with Ivan in the town. Ivan made a particular friendship with a retired vicar called Roger Fry. Ivan shared with Roger his desire to give the next generation a hope for the future especially needy, orphaned and abandoned children. Ivan asked Roger when he returned to ask if people in the UK would stand with him in making the dream a reality for these children. Roger returned to St Johns in Ben Rhydding and a support group was formed. By February 2001 land had been bought and the first block of the Revival Centre completed to provide a primary classroom for 30 children. Ivan has worked tirelessly for the last 10 years to develop the Centre to provide a primary school for 450 pupils, a secondary school for 200 pupils, an orphanage for 130 needy and orphaned children, a clinic serving the children and the community and a church which supports a number of satellite churches across the district. In July 2009 a farm was established to help reduce food costs, improve the children’s diet, teach skills and generate income. The extent of Ivan’s commitment to the next generation in his country and the extensive hours he works is truly humbling. Every year Ivan makes the commitment to come to the UK to give updates to supporters and share something of Uganda with school children and the wider community here. Ivan has a wife Allen (who is the Champions Coordinator) and six children Ashley, Ivana, Elisha, Marianne, Solomon and Isabelle.